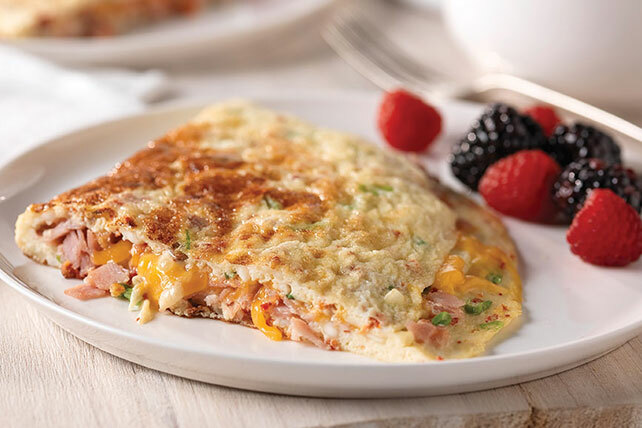 Discover everything an omelet should be with this Ham, Cheese & Sun-Dried Tomato Omelet. Make your morning great with this sun-dried tomato omelet! Whisk first 3 ingredients in medium bowl until blended. Stir in onions and tomatoes. Heat heavy 10-inch nonstick skillet sprayed with cooking spray on medium heat. Add egg mixture; cook 4 min. or until almost set, occasionally lifting edge with spatula and tilting pan to allow uncooked portion to flow underneath. Top with ham and cheddar; cook 2 to 3 min. or until egg mixture is set and cheddar is melted. Slip spatula underneath omelet, tip skillet to loosen and gently fold omelet in half. Cut in half. Serve with your favorite fresh berries.